Friday calls for lighter fare, so today I thought I would present evidence that this financial crisis we are now living through is not particularly unique. Realizing that some may find the idea that we are doomed to go through this every few decades less than cheering, I will present it in the form of a quiz. As I’ve said before, everybody likes a quiz. In what year did BusinessWeek editorialize as follows about the stock market? 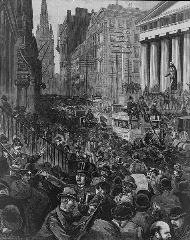 For five years at least American business has been in the grips of an apocalyptic, holy rolling exaltation over the unparalleled prosperity of the "new era" upon which we, or it, or somebody has entered. Stock prices are generally out of line with safe earnings expectations, and the market is now almost wholly "psychological." 1999 or 2000 are good guesses. Sounds like the top of the dot-com bubble doesn’t it? Remember all that talk about how the web had ushered in a new paradigm of business and how three digit multiples for internet stocks made perfect sense? And all the hand-wringing that went with it? I repeat what I said at this time last year and the year before that sooner or later a crash is coming…. The Federal Reserve System has put banks in a strong position, but it has not changed human nature. The word “crash” gives it away. Both quotes are from 1929. 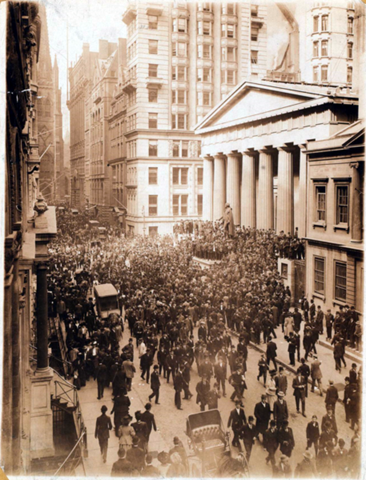 Five thousand of the unemployed demonstrated on Wall Street chanting "We want work," and demanding that banks open up credit lines to businesses promising work. … Populist mayor ____ demagogically denounced Wall Street, declaiming that “those who produce everything get nothing and those that produce nothing get everything.” He was instantly abandoned by his onetime conservative backers in the business community. The New York Times accused him of raising the banner of “the most fiery communism.” … When ____ was unceremoniously dumped from the Democratic Party ticket, his friends blamed it on “Wall Street Democrats” who were more than ready to see the government bail out failing banks, but not destitute workers. Some of the politics may sound familiar today, although it is hard to imagine the Times complaining about fiery communism or a New York mayor being dumped because of it. 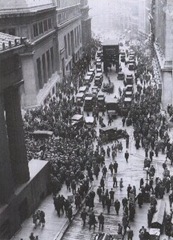 You might have guessed the 1930s, when mass protests, communism, and the justice of government bailouts were in the news. But you would have been off by 73 years. This was a description of the panic of 1857. "People who have had such faith in the stability of those markets are going to be forced to evaluate what they consider stable, predictable and important in life." said Dr. Steven Berglas, a Boston psychologist. "Their sense that the more they made, the more control they had over life is going to be totally ripped from their psyches, and for a lot of people it’s going to be very stressful." "You get security from a friend, from a family, from a network, from community," he said. "People are going to be looking around and seeing how vulnerable they are, how they have no one to turn to, that they have no one comforting them over the prize bottle of Margaux. Those are the people who are going to get hurt." ____, the venerable Wall Street analyst, said "these yuppies are unprepared and unconditioned" for a bear market. "They’ve greeted every one of these bad days as buying opportunities and as quasi corrections." This pseudo sympathy for the traumas of formerly well paid young people sounds familiar, doesn’t it? But it’s not that recent. This is from October 21, 1987, two days after what is still the worst single day in stock market history, in which the S&P 500 lost 20.4%. 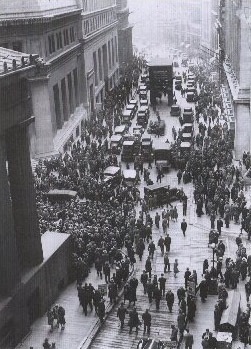 Long term effects of Black Monday were possibly less traumatic than anticipated. The S&P would end 1987 down slightly less than 2% for the year. Over the next 12 years it would average 19.06% return annually. One of my favorite bits of wisdom is the quip, attributed to John Templeton, that "The four most dangerous words in investing are ‘This time it’s different.’" To be sure, the details really are different. But the big picture stuff, the parts we care about, are pretty much always the same. Because even though the names of the companies may change, and the technology may progress, what drives the market is people, and we haven’t changed at all. I love the quotes “those who produce everything get nothing and those that produce nothing get everything..” and “The four most dangerous words in investing are ‘This time it’s different.’” Truly speaks to what and who we value in societies (at least in the west) and the shortsightedness of our memories.. The Times is mostly pro-fiery communism these days. Thanks for including the photos. I wonder what photo from this period people will use in the future as the graphic that best represents the mortgage meltdown. If you are a value investor, then a recession truly is a buying opportunity though, isn’t it? I agree that people don’t change in fundamental ways. And markets are comprised of people. So I suppose that it’s also fair to say that markets don’t change in fundamental ways. But the environment in which the stock market operates has changed in ways that I believe might be described as fundamental. We are a richer people today. That means that preserving and growing money have become more important goals. What makes this crisis different is that this is the first stock overvaluation crisis that is going to cause millions of middle-class retirements to fail. In the old days, most middle-class workers did not aspire to financially stable retirements. We worked until we were too sick or old to go on. So the difference this go around is a plus. Still, it is not perceived as a plus. Going from thinking that you will be able to retire to accepting that you will not is a hard blow. 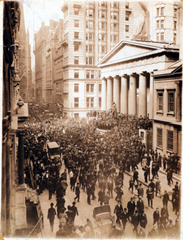 My view is that all of the economic crises suffered in the United States in the 20th Century were suffered as a result of the idea that there is no need to change one’s stock allocation when prices go to insanely dangerous levels (this idea has been promoted in recent decades as the “Passive Investing” concept). In the aftermath of earlier crises, people stepped back from the idea that valuations don’t matter and adopted more conservative investing strategies. But no one ever put a stake through the heart of the Passive Investing concept. So it always came back to life a few decades later, after people had forgotten how much damage it had done. My hope is that this time the damage is going to be perceived as being so great (because the dashing of our hopes for financially secure retirements will this time affect far more people than it has ever affected before) that we will kill this idea that valuations don’t matter once and for all. If that indeed happens, this one will go down in history as the economic crisis that brought on a fundamental change in our understanding of how stock investing works. I think that we might someday look back on all this as having been the best thing that ever happened to us. I certainly hope that it turns out that way. I had to go over to Wikipedia to look up dates for Karl Marx – I really was dating the “The Commie Manifesto” to about 1890-1910, not 1848. I blame public schools. As usual, there are several thought-provoking comments here. With regard to human nature, there is nothing that will change it — at least in terms of nature’s cycles, which includes human behavior. With specific regard to financial markets, the sentiment cycle does not change, either — only the basic shape changes (i.e. the duration of the particular emotions prevailing in a given time). For example, there is no doubt that hope will again be the prevailing sentiment (if not already), just as complacency will return. The specific time fore complacency to manifest itself again is not known at this moment. Once complacency returns the door will open for greed.